There are two things I love for sure: comedy and science. It's rare the two intersect, but when they do, amazing things happen. Dara O'Briain studied mathematics and theoretical physics at University College of Dublin before embarking on a career in comedy. I love this rant on the public perception of math and science and anti-science in the media, from his comedy special Talks Funny. "Science knows it doesn't know everything, otherwise it would stop." 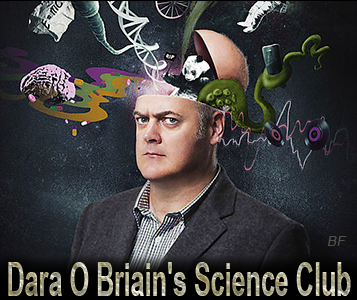 Dara currently hosts a television show Dara O Briain's Science Club on BBC Two. Each episode explores a different scientific topic in an informative, accessible, and humorous way. I love it. I wish there were more shows like this on American television. Episode 1 investigates human reproduction and genetics. I loved the bit about the invention of bicycles and personal transportation helping diversify the human gene pool. More episodes may be available on Youtube, unless you're lucky enough to live in the UK and watch it on BBC. Hey, check out BBC Radio's Infinite Monkey Cage podcast for an astrophysicist and a comedian co-hosting a scientific discussion, its pretty good and funny too. I love podcasts! I will definitely check it out. Thanks!